Sitting on my father’s patio in Phoenix, Arizona, enjoying the warm weather, I feel very removed from Szeged, Hungary. And yet I also feel unaccountably homesick for it. I heard from two friends there today, which got me thinking about it. 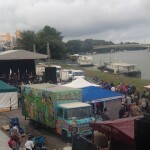 And it is high time (way past time, in fact) that I write about the city where I spent the majority of my Fulbright time. So here goes. 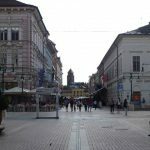 Szeged is the third largest city in Hungary, with about 160,000 people, which makes it really a smallish to mid-size city. It has a first-rate research university, where I was lucky enough to teach for the fall semester. 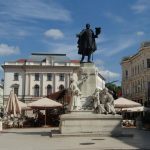 When I had been in Szeged perhaps six weeks, I met a colleague in the English Department, who asked if I spent all my time in Budapest. Somewhat nonplussed by this question, I said no, and he asked why I would spend my time in Szeged when I could be in Budapest. A good question, I suppose. And as you’ve heard, I do love Budapest and did spend quite a bit of time there. 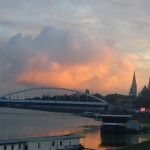 But Szeged was my home in Hungary, and I was quite content living there. In New York I live in a small town (the population of Dunkirk-Fredonia is a bit less than one-sixth of Szeged’s). But despite Szeged’s larger size, it felt comfortable to me. The city’s core, where I spent most of my time, is probably not much bigger in area than Fredonia. 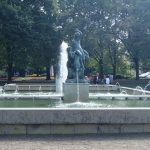 I could walk pretty much anywhere I wanted to go–to work, to the mall, to the grocery store, to restaurants, even to the train station. And if I had luggage or the weather was bad, I had not one but three different modes of public transit from which to choose: tram, bus, or trolley. Add the odd lift out to the Super Tesco and I was set. And this is one of the things I loved so much about living in Szeged. I adore the compact nature of European cities, where you can walk virtually everywhere. Even in Budapest I walked most places. And there is so much to see as you walk. 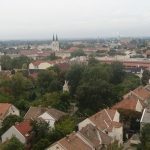 From my apartment every day I walked through a lovely park and across the bridge spanning the Tisza River into Szeged proper. 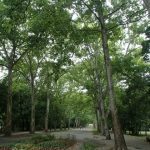 From there I had my choice of routes to the university–along the river, down the pedestrian street, or down any combination of other streets. Along the way there were cafes and shops and grocery stores and bookstores and restaurants and public squares, complete with benches on which to sit and people watch. 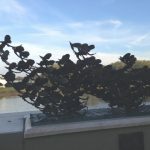 Here are some scenes from my walks. 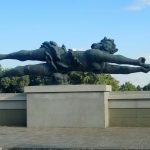 Dragonfly Sculpture along Tisza R.
Flood memorial along Tisza R.
So I didn’t need to spend all my time in Budapest because to me, Szeged itself was a daily adventure. 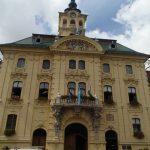 One of the things dearest to my heart about Szeged was its architecture. In 1879 the city suffered a devastating flood, which destroyed most buildings. 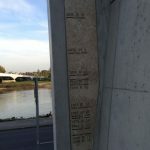 Afterward they raised the level of the city (indeed, as the flood marker by the Tisza shows above, they have had far higher water levels since then but no flood has done the damage of 1879). And then they set about rebuilding. Much as Chicago after its great fire became a place for architectural innovation, so too did Szeged, albeit on a smaller scale. Instead of structural steel skyscrapers, however, Szeged built palaces or palotas (as they called mansions) and other buildings (some of which did use structural steel, admittedly) in a variety of styles, including neo-classical, eclectic, and, most notably, Art Nouveau or, as it is often called in Hungary, Secessionist style. 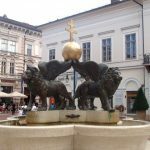 (The Secessionist moniker comes from the Viennese artists, including Gustav Klimt, who seceded in 1897 from the Viennese Artists Association–see here for more.) 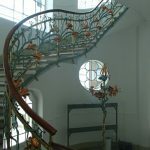 Art Nouveau was a turn of the century movement of design, architecture, and applied and decorative arts that embraced sensuous curves and geometric forms, with natural (think flowers, leaves, e.g.) and folk art motifs. 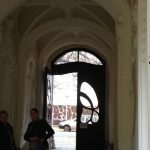 If you’d like to know more about Art Nouveau in Hungary, see this. 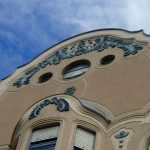 And Szeged (along with the nearby towns of Subotica and Kecskemet) is home to some of the most stunning Art Nouveau I have seen. 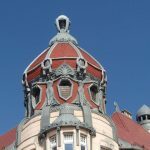 It often features Zsolnay ceramics, including roofs as well as decorative elements, and Hungarian folk art motifs such as tulips, hearts, and peacock feathers. So let me introduce you to Hungarian Art Nouveau. 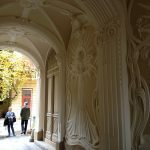 The first Art Nouveau mansion I “met” on my first full day in Szeged was the one that remains my favorite, the exquisite Reök Palace. A graceful asymmetrical white building with green trim, adorned with purple irises and green leaves, and featuring curvy balconies and balustrades with trailing wrought iron vines, it resembles nothing so much as a fantastic wedding cake. 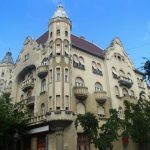 It was built in 1907 by the architect Ede Magyar, called by some Hungary’s Gaudi, who of course has a romantic story. 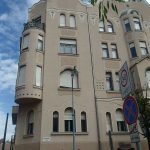 Falling in love with the wife of one of his other clients in Szeged, he ended up killing himself in 1912, at the tender age of 35. Reök Palace is one of the jewels of Szeged, and today it houses an arts center and exhibit space. 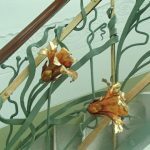 Perhaps the most remarkable architectural detail inside is a curving green wrought iron staircase with copper flowers “growing” and twining all the way up. Fantastic! A close second for my favorite piece of Secessionist architecture and design is the New Synagogue, which is perhaps the most beautiful one I’ve ever seen. 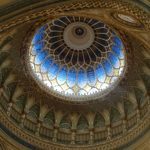 It was built in 1903 in what has been called Moorish-Art Nouveau, and it is magnificent. Szeged’s Jewish community numbered almost 6000 at this time (and grew to almost 8000 in the 1920s at its height), and this synagogue seats more than 1300. 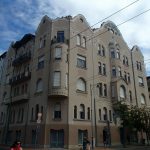 The architect was Lipot Baumhorn, who built 25 synagogues in Austria-Hungary. 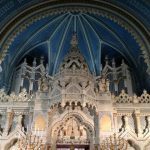 He was known for his eclectic style, mixing Art Nouveau with Moorish, Gothic, Romanesque, and other architectural elements, which can be seen in the synagogue. 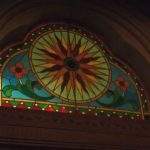 The dome and stained glass in the interior, which are stunning, were designed by the great Art Nouveau stained glass artist Miksa Róth. Tragically, close to 3000 of Szeged’s Jews perished in WWII, mostly in the concentration camps. Although some returned to Szeged after the war, today the Jewish population is only about 500. 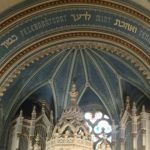 For more on the synagogue and the history of the Jewish community in Szeged, see this. Ede Magyar did most of his important work in Szeged, contributing hugely to its reputation as a center for Hungarian Art Nouveau. 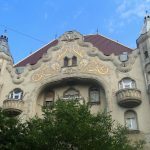 Beyond Reök Palace, one that I particularly like is the Ungár-Mayer Palace, built as an apartment building (which it still is today). Like Reök, it features sensuous curves, this time in pink accented with red and grey. 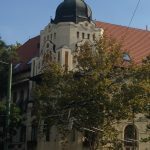 It sits on a corner of the lovely space of Dugonics tér, where you can sit at a cafe in the summer, sip a lemonade or a beer, and drink in the wonderful architecture as you people watch. Its outstanding feature is its cupola adorned with with lovely dancers, allegedly modeled on ballerinas. 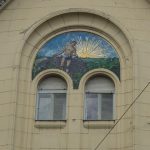 Another noteworthy buildings is the Palace of the Reformed Church, which features colorful mosaics above the windows and sculptures of children, which suggest its former function as a school. 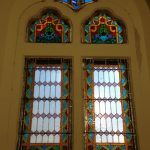 One of Magyar’s last commissions was a charming apartment building called Shaffer Palace, but unfortunately the tenants decided upkeep was too costly and got rid of many of the decorative elements in the 1920s. 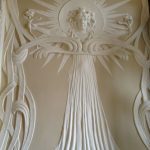 We got to sneak inside one day, as the gate was uncharacteristically open, and saw some of the last remnants of his design, with sylph-like women (reminiscent of those on Ungár-Mayer) in the entryway. 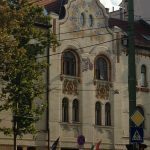 There are a couple of buildings by Ferenc Raichl, another of the foremost architects of Hungarian Art Nouveau. The Gróf Palace features a golden mosaic design. 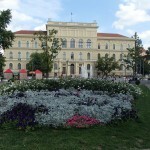 The Raichl Palace was built as an apartment building and, after functioning for a time as a theater, today serves as main building for one of Szeged’s high schools. 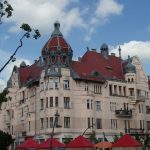 Another Raichl with different design motifs is the Moricz Palace, which is now an apartment building. 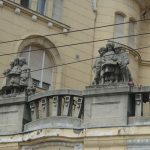 Some of the exterior decorative elements were apparently removed after WWII when it became an apartment building. 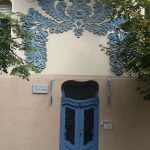 But some lovely blue leafy folk decorative elements remain and have been restored, and I love the blue door. And that apartment with the balcony on the corner–there is a place I could live! (Although an apartment at Ungár-Mayer would also be great, so long as we’re dreaming.) As a Moricz Palace is on Szent Isztván tér, overlooking the water tower. 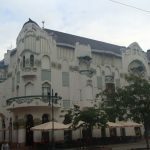 Other notable early 20th century buildings in Szeged include the Deutsch Palace. I came across this strolling near the Tisza River one day, and was enchanted by the tulips. Is it any wonder that I love the architecture here, when tulips and irises are among my favorite flowers? 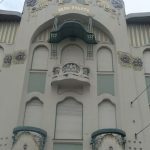 The Deutsch Palace has not yet been fully restored, but let’s hope it finds a benefactor who will do so soon. 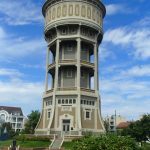 Another fine example of Secessionist architecture in Szeged is the Water Tower, built in 1903-4 according to a design by Dr. Szilard Zielinszki. It seems to have been an influential design, as I saw many water towers around Hungary and Szeged that were similar. 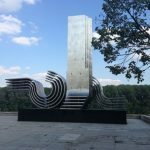 It’s built of reinforced concrete, and designed with a spiral staircase that goes up the center, with the water holding tank surrounding it. 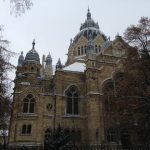 One Saturday a month they open it to visitors, and I took this opportunity to explore it and climb up to the top for some great views of Szeged. 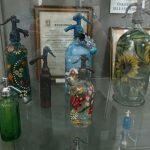 As a bonus, they had an exhibit on the history of soda water, which allegedly was invented in Hungary. A final favorite of mine was the City Hall, designed by the famous Hungarian architect, Ödön Lechner, known particularly for some of his Budapest works, especially the Applied Arts Building (see my post on Budapest and Prague). So ends our tour of Szeged. 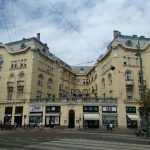 See my various posts on Budapest for some of its great architecture. 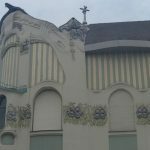 The next post will continue the Art Nouveau theme with trips to Kecskemet and Subotica, the latter just across the Serbian border. 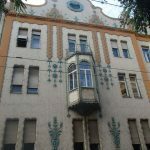 In the meantime, if you’d like to learn more about the Art Nouveau in Szeged and the region, this website, a joint project of Szeged and Subotica, features Art Nouveau “tours” and a lot more information about each building.